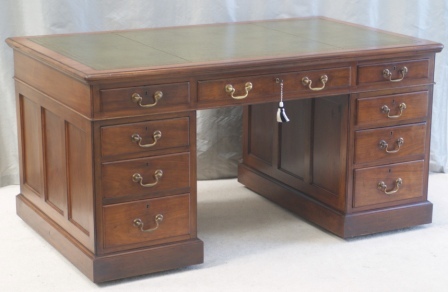 An impressive Antique Walnut Pedestal Desk. Superb colour and proportions. Medium Size. Victorian. Excellent green tooled leather writing surface inset into moulded top. Three frieze drawers and three drawers to each pedestal. Plinths to each pedestal and concealed wheeled castors beneath. Excellent original swan neck handles to each drawer. Drawers have hand cut dovetail joints and dust mouldings. Matching set of original Hobbs locks with keys Panelled sides and rear. Good history.